Whenever I sin, I dim the light of Christ in my soul. When I sin mortally, I extinguish it entirely - I am empty & alone. 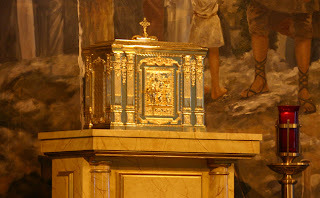 I become an empty tabernacle (Thank God for His Mercy in confession which can restore us! Yes, God can & will forgive you!). Whenever I choose Christ, love Him or receive His love, pray to Him, or serve Him in my brothers & sisters, His light & presence grow within me. The Divine Fire of the Holy Spirit increases in my heart. I become a shining lamp to others, to lead them to Christ [so they will] become ever more mature children of our Heavenly Father. I am His living tabernacle! A church building is built large enough so many people can gather & worship together; but a tabernacle is fairly small - yet it is the Throne of Christ the King, the uncontainable God of the universe! 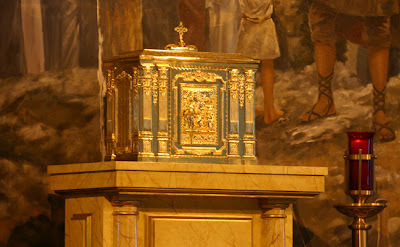 The tabernacle & altar are the *heart* of every church. They are carefully adorned. This is the place of love & sacrifice, the place of God's abiding presence. But I must freely invite Jesus to reign in my own soul in order to share the joy of the Heavenly Liturgy. And He needs a *welcome space* to enter, not a room full of useless junk. What are some things or attachments in my life that may be cluttering the “church” of my life or the tabernacle of my soul? It's time to take inventory & clean house! Don't worry - Jesus WANTS all your garbage! He gladly changes it all into everlasting treasures...The one *true treasure* He wants is YOU!